MedCheck connected heath devices connect to the smartphone via App. The App keeps history of blood pressure, glucose, weight and body composition in easy-to-understand graphs and filters. The App also records height, weight, family history and lifestyle habits, to provide personalized diet and fitness recommendations, so users can start to play an active role in their own healthcare. 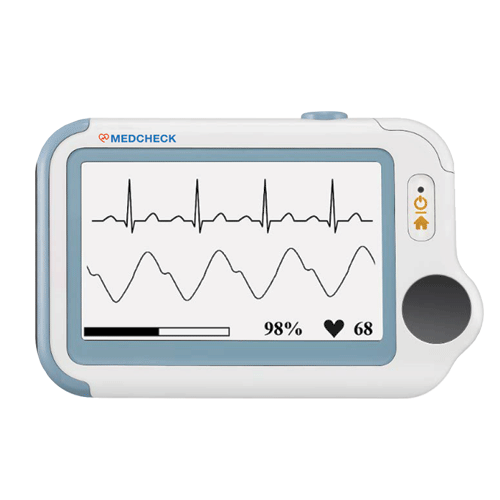 How do MedCheck devices connect to App? MedCheck use Bluetooth Low Energy to connect to App. Once paired and App is open and nearby, reading will be transferred. Yes. MedCheck Devices uses normal AAA Battery and is replaceable. How many readings can be stored in MedCheck Devices? App can store unlimited readings. 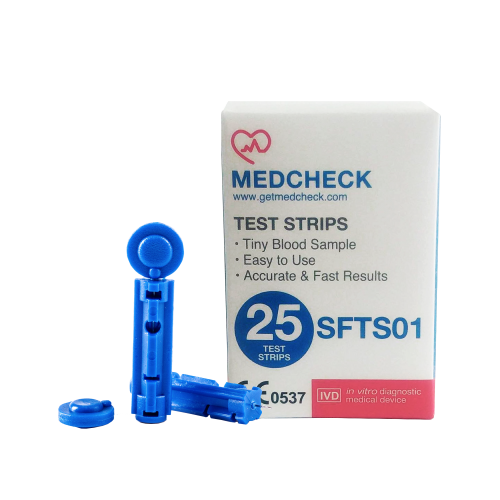 MedCheck Blood Glucose Meter can store up to 120 test results with date and time automatically in its memory. When full, the meter will replace the oldest with the latest result automatically. MedCheck Blood Pressure Meter can store up to 120 memories for 3 users, and automatically replace the oldest data with the new one. After each measurement, the systolic and diastolic pressure, heart rate, pulse, BP Category Indicator, and Irregular Heartbeat Detector symbol (if any) with date and time will be automatically stored. 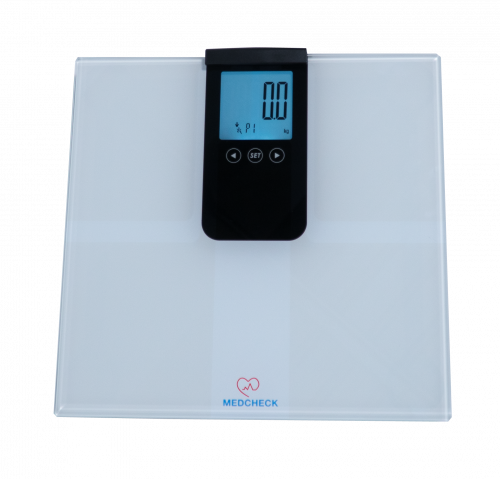 MedCheck Body Scale can store unlimited readings but once App is connected all readings in device are automatically deleted. Can measurements be taken without connecting to the app? Yes. Measurements can be taken without being connected to the MedCheck App. All stored readings will be displayed when App is connected. What happens when reading is taken with App connected? If Device is already connected to App and you take a new reading, that new reading will be automatically pushed to your App screen for you to assign it to a user. How to connect Body Scale to App? Press the button behind Body Scale for 3 seconds till the screen starts showing buffering symbol. Open ‘Paired Device’ page in App by click on the connect icon. Once the device appears with ‘pair’ written on right side, click on it. App will ask you to choose user id of device. App will ask you to assign user of the App. App user’s profile will be sent and stored on device automatically. Now you can take reading and it will be sent to App automatically. Repeat above steps to link remaining user ids of the device to same phone or other phones. How to connect Blood Pressure Meter to App? Open Bluetooth and Location on your Phone. Press the power button on Blood Pressure meter one time to power on the device. On ‘Paired Device’ page in App, click on ‘Register’ next to your device ‘Mac Address’ to link the device to your account for the first time. From 2nd login onwards, you can click on ‘Connect’ to connect the device. If you miss to connect at first try and the app keeps buffering, wait for the hardware display to turn off and then power on and connect again. After ‘Register’ or ‘Connect’, App will go to Blood Pressure screen and all new readings in the device will be listed for you to assign to users. Please note that after connection, the App will automatically update device time to sync with phone time. How to connect Blood Glucose Meter to App? Press any button on your blood glucose meter to power on the device. After ‘Register’ or ‘Connect’, App will go to Blood Glucose screen and all new readings in the device will be listed for you to assign to users. From 2nd login onwards, you can click on ‘Connect’ to connect the device. How to add a phonebook contacts so they can get SMS? Click on Contacts below in homepage. Make sure Phonebook is selected on top. Click on the Search icon on top left. Search and ‘Add’ Phonebook Contact. The added Phonebook contact will appear on the Contacts page. Right-click on Edit or Delete. When you assign reading in future, Phonebook Contacts will receive SMS informing about your reading. How can I notify the readings to my contacts? MedCheck App allows the user to send SMS to 5 phonebook contacts every time reading is taken. So, the contacts will be notified and they will get readings automatically. It is ideal for aging parents so that children can keep track of their health 24×7. How to add a new user of App? Click on ‘+’ icon on the right side of the drop down user menu on top to add family member. Add details and click on ‘Add Family Member’. Now you can assign readings to your family members. How do I set reminder? Click on menu then Reminders to set a reminder. Once set, App will notify at the time specified, so that users never forget on their regular checks. Does MedCheck connect to all phones? Yes all phones with Bluetooth 4.1 and above. How to view readings in the App? After you ‘Register’ or ‘Connect’, it will show all new readings in Blood Pressure Meter / Blood Glucose Meter that have not been saved in the App before. Click on respective reading to assign it to any user. After assigning, App will go to homepage which will show all assigned readings in the graph. Can I find doctos nearby? The MedCheck App allows users to find and add Doctors in the same city. Doctors get their own login to see the complete history of their patients. How to add a doctor? In Contacts page, select Doctor tab. Click on the Search icon on the top left to see Doctors within 25 km radium of you. Click on ‘Add’ to add any Doctor. Added Doctor will need to accept your request before he/she can become your doctor. After Doctor accepts, you will receive SMS and App notification and he/she will be able to see your complete history via App or Web panel. How can I use the readings in MedCheck when I go to visit my doctor? MedCheck app compiles the data into pdf or csv reports, which you can print and bring to doctor’s appointments. The valuable insights on the state of health over time will enable doctors to take informed decisions on their medications and relevant treatments. Click on menu the export data to do this. How can a doctor become part of MedCheck? To be part of Community of Doctors in MedCheck App, please email doctor@oursmartfuture.com . The team at Smart future will add you in the list and then provide you with login details. How can a doctor add or request patients in the app? When user adds you as Doctor, he/she will appear as Request in right tab in homepage. To add the user to your list of Patients, click on the tick mark and he/she will appear as Patients in left tab. To reject the Request, click on the red cross. How can a doctor view the readings of added patients? You can see all your Patients by clicking on the left tab in homepage. You can click on any patient’s name to see his/her history of Blood Pressure and/or Blood Glucose. From the drop-down menu, you can select family members of user and see their history as well. How long will it take to get the Glucose test results? 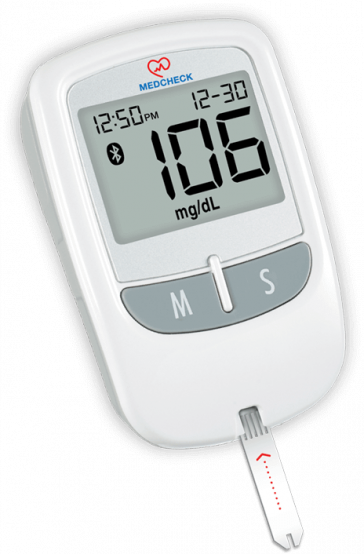 The Glucose test results will be displayed in 5 seconds, once the blood is detected by the Blood Glucose Meter. How far can the devices and phone be to sent readings to app? The device and the phone should not be more than 10 meters. 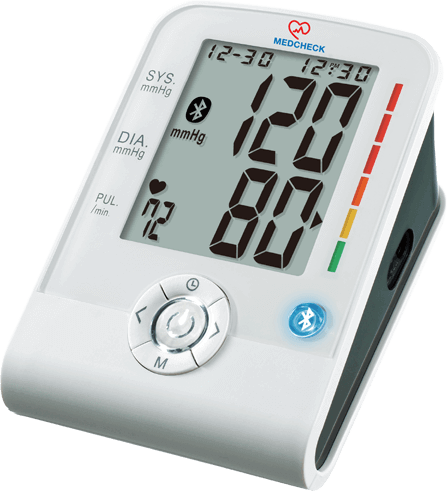 What is warranty policy of Blood Pressure Meter? 2-year limited warranty against defects in materials and workmanship. This warranty applies only to the original purchaser of the meter. What is warranty policy of Blood Glucose Meter? What is the recommended recalibration suggestion for Blood Pressure Monitor? To ensure continued measurement precision, all digital blood pressure monitors require recalibration regularly. After 2 years from the manufacturing date, we recommend you have your MedCheck Blood Pressure meter recalibrated at the local distributor. Please contact your distributor for the details about the recalibration service and the charge of shipping and handling. What is warranty policy of Body Scale? You will find many ways to contact us, whether you are looking for information or would like to solve a problem. Please browse through our support page to find answers for general issues. If you would like to talk or chat to an agent, we are available Mon-Fri 10am-6pm SGT (UTC +8). You can contact us through live chat and we will answer any questions you have in real time. For all further inquiries Visit contact us page and we will be in touch within 48 hours.